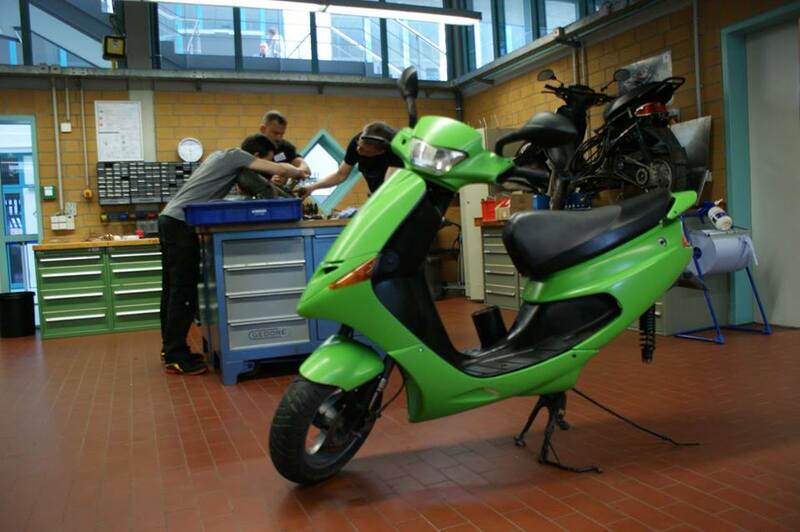 Converting 2-stroke Scooters to electric drive - 1530007762s Webseite! 2-stroke scooters are proven to emit more pollutants than any other vehicle on our roads. Not to mention the disturbing noise! 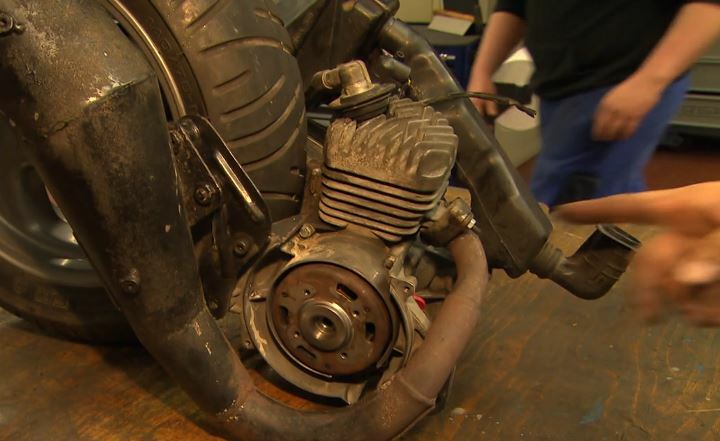 For this reason, the team around motorEcycle puts defective 2-stroke scooters as electric vehicles back on the road. In addition to electromobility, the themes of education, environmental protection, resource conservation and sustainability are in the foreground for us. 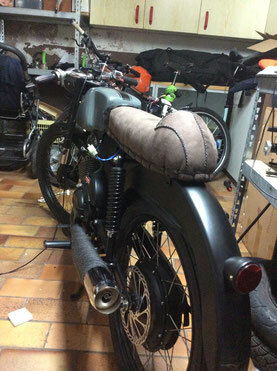 We offer workshops in which you recycle a scrappy 2-stroke scooter by yourself and convert it to electric drive. 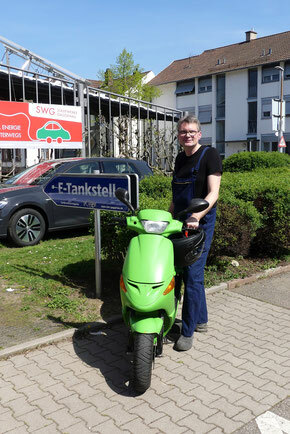 At the end, there stands an emission-free electric scooter in front of you, which in the best case is charged via a solar station. First, you discuss all relevant data to obtain the street approval. 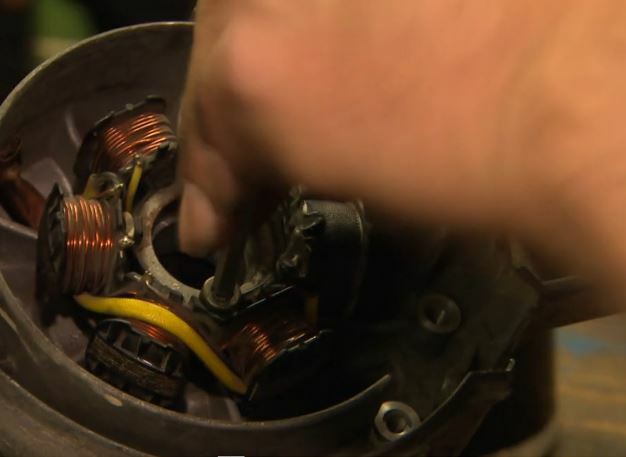 In accordance to this you select parts such as the electric motor, the battery and the power electronics. In teamwork you are now freeing the 2-stroke scooter from all conventional drive train components. 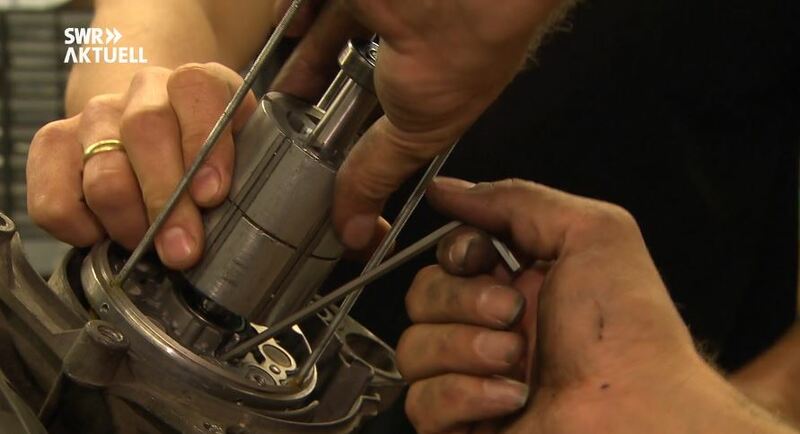 Exhaust system , tank and oil filters: You dont need them anymore. 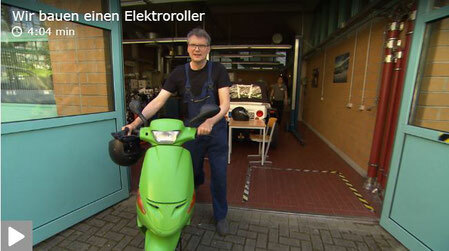 Now you are considering how to integrate the new electric drive modules into the scooter. You will construct and even manufacture brackets and mounting points yourself. The last step is the electrification of the scooter. 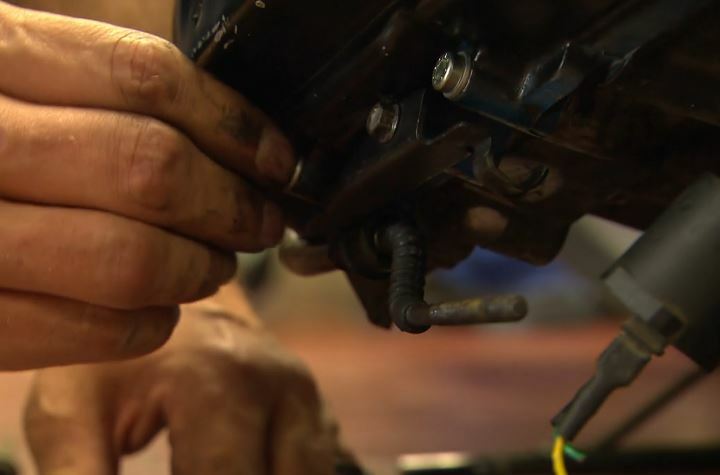 You will use lithium batteries, connect the main power circuit with the electrical system via DCDC Stepdown and mount the chain, the pinion and the wheel. 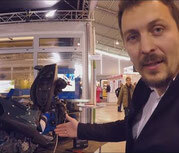 In a short time there stands an electric vehicle in front of you, which you have built by yourselves! Do you want to use your scooter as an educational project, as an everyday vehicle or as an outstanding marketing tool? We adapt professionally and flexibly to your wishes. Special thanks to Mr. Hentschel. As a Member of Parliament and spokesman for electromobility in Baden-Wuerttemberg, he supported us decisively in the prototype phase. 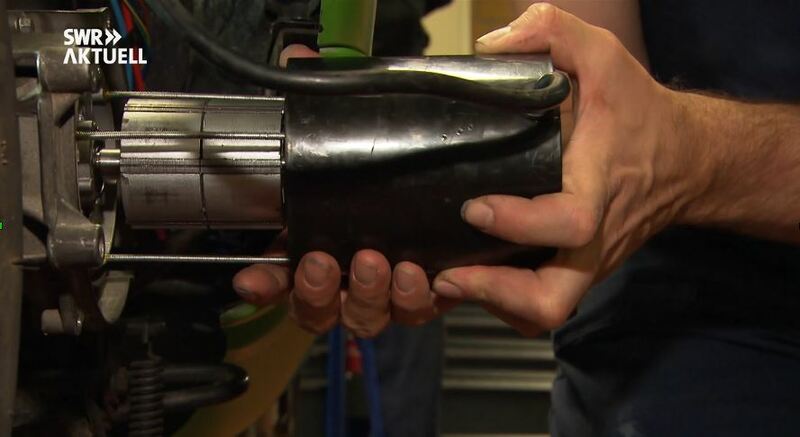 After you recycled your scrapy 2-stroke scooter to an electric vehicle, in terms of performance the new version works at the same level as the old one. In terms of efficiency, noise and emissions, it beats its predecessor by far! The total weight increases only slightly or even falls depending on the batteries used. Your recycling scooter accelerates faster than a standard 2-stroke scooter in the first few meters, and is much quieter. The range is up to 40km, depending on the type of battery. With transportable replacement battery the range is up to 80km. Convince yourself of the performance of our earlier conversions and ask for a non-binding and free test drive by calling us, using the contact form, or just E-mail us. 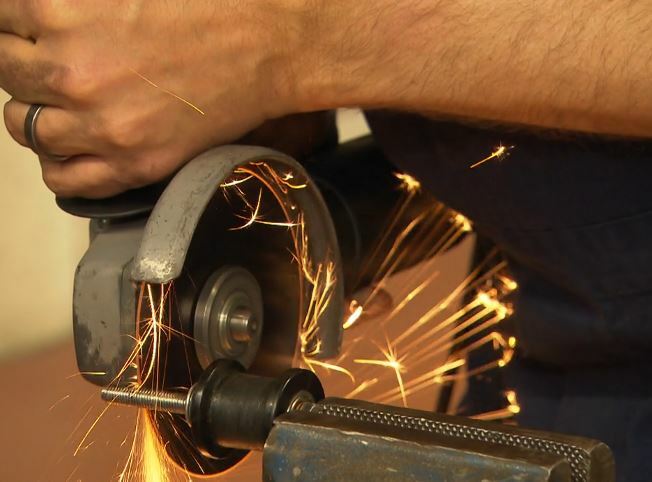 Workshop and do it yourself? Electric conversion as an order? Your conversion in a promo? We are flexible and professionally prepared according to your needs. 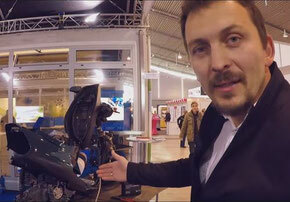 We visit you for a full day and explain in detail how to realize your own e-mobility project. We give you tips on how to buy a used two-wheeler, tips for optaining all the necessary electric drive components, the tools you need and the street approval certification procedures. 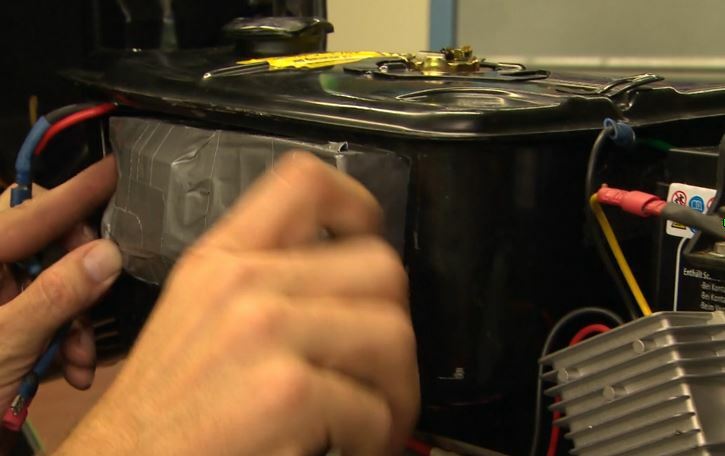 Our lecturer explains with the help of pictures, videos and a detailed script how to convert an old electric scooter into a modern electric vehicle. If you wish, we also take care of organizing a suitable Scooter for your project. We are pleased to personally manufacture special components such as adapters and couplings according to your moped model. If you face problems during your project, we will be happy to assist you for a full or half day. We bring a lot of experience and all the right tools. Starting with cable ties to the mini lathe. With us, you can make fast progress. Of course, you can also count on us in the last step - the registration of your vehicle. For this Workhop the costs are depending on the intensivity of our personal support for you. The costs also depend on the type of batteries you want, and if you need a permisson for public roads.